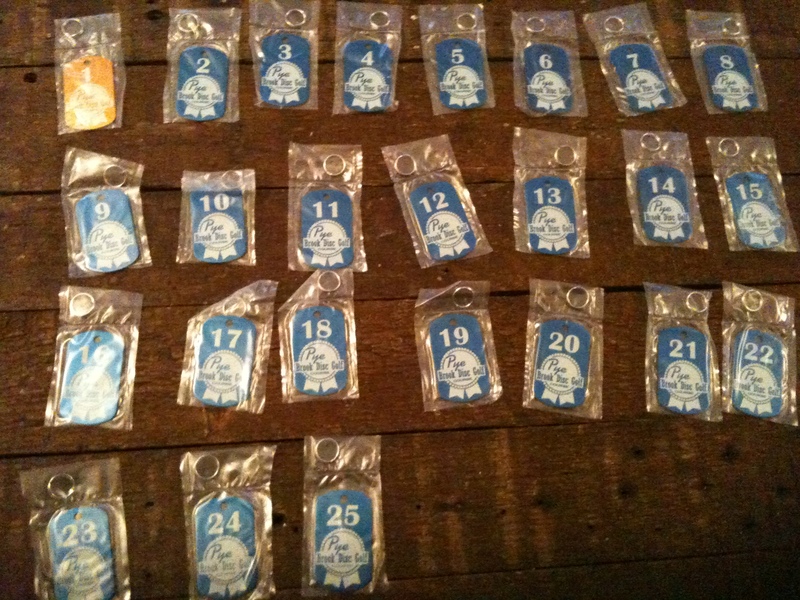 All 25 bag tags the day I received them! Shiny, unique, and sometimes super creative; bag-tags adorn the majority of disc golf bags. The idea is to assign a number to a given player, and then use it as a status for a given round of golf. If #4 plays #13, and loses- the two players would switch tags. In the end, the player with the #1 tag would literally be the #1 disc golfer for that group. Some issues seem to arise however, when it comes time to implement the rules and guidelines. As the season starts, the idea is to sell as many tags as possible to a variety of players. GET THOSE TAGS OUT THERE AND SELL SELL SELL!!! Cool. Now the next step is to play a weekly round and put the tags into play and let people duke it out and see who comes out on top. It isn’t always this simple though, because people can get injured. Families have babies. Some people move away. In other words: things happen. With each “thing” that happens, a tag gets taken out of play. Soon enough, you’re missing the #2, #3, #6 and #9 tags (or more) and the weekly winner of the tag round is taking home a mediocre tag number, like #15. This isn’t exactly a tragedy, and is certainly nothing to get worked up over, but begs the question, “What’s the point?” If they won’t take the tags serious enough to keep accurate status numbers, why did you bother buying one? If the idea was to get money to go towards the course, then in reality, the mission was accomplished when they sold the last tag. And that’s cool. But if the tags were intended to mean something, and withhold a certain amount of intrinsic value- and therefore be something “worth winning,” then it follows that the rules need to be followed. For example, if a player can’t make it for a long time, they are responsible for returning the tag and swapping for the next or highest number in play. The other issue that comes up is a bit of a turf-war thing. Some folks are in the camp of “COURSE TAGS.” These are tags that belong to a course in essence. You play for the course tags at the course, because each course is different and “OUR COURSE is the best.” Yet at the same time, some other folks are in the camp of “WAGER TAGS.” I look at these folks as the type that love putting money down on every round and they like the pressure of having something on the line. They could be two states away from their home course, but they’ll put up their bag tag anyway, just as long as a fellow tag-holder is there to play against. In either case, the system should even itself out, and the most talented player should win the #1 tag in the end. In my experience though, the loudest advocates for playing for bag-tags at a “non-home-course” location, are the ones who tend to disappear and become too busy to travel back to the original course and put up their tag where it belongs. This isn’t a problem if there are guidelines in place to get the tags back into the hands of the local players that go out on a regular basis and play a particular course. Last year I put together a bag tag season at the local course, and things went pretty smoothly. The strong majority of players are nice guys who understand the idea of having a tag. We changed rules here and there, and in the end- we had a super epic “Tags Finals” tournament. The end of year tournament was a reward for the players that showed up on a regular basis, and we all had our fill of little bonus prizes and got a chance at a decent purse if we won. It was my first year getting involved in a bag tag season, so I learned a lot. Next year will hopefully go even smoother, and end with an even more epic tag-finals tournament. The most important thing I realized is simply that bag tag seasons abide by the golden-rule. If you treat them as if they’re important, people will play for them as if they’re important. If you do the opposite, and treat them as decorations for bags, you’ll end up with a bunch of shiny, numbered key chains. Yay? This entry was posted in Stories and Miscellaneous and tagged bag, disc, golf, starting, tag. Bookmark the permalink.